As NASA's New Horizons mission continues exploring the unknown, the mission team has selected a highly appropriate nickname for its next flyby target in the outer reaches of the solar system. Thule was a mythical, far-northern island in medieval literature and cartography. Ultima Thule means "beyond Thule"– beyond the borders of the known world—symbolizing the exploration of the distant Kuiper Belt and Kuiper Belt objects that New Horizons is performing, something never before done. "MU69 is humanity's next Ultima Thule," said Alan Stern, New Horizons principal investigator from Southwest Research Institute in Boulder, Colorado. "Our spacecraft is heading beyond the limits of the known worlds, to what will be this mission's next achievement. Since this will be the farthest exploration of any object in space in history, I like to call our flyby target Ultima, for short, symbolizing this ultimate exploration by NASA and our team." Looking for a more inspirational albeit temporary moniker than the designator 2014 MU69, NASA and the New Horizons team launched the nickname campaign in early November. Hosted by the SETI Institute of Mountain View, California, and led by Mark Showalter, an institute fellow and member of the New Horizons science team, the online contest sought nominations from the public and stipulated that a nickname would be chosen from among the top vote-getters. The popular campaign wrapped up on Dec. 6, after a five-day extension to accommodate more voting. The campaign involved 115,000 participants from around the world, who nominated some 34,000 names. Of those, 37 names reached the ballot for voting and were evaluated for popularity – this included eight names suggested by the New Horizons team and 29 nominated by the public. The team then narrowed its selection to the 29 publicly nominated names and gave preference to names near the top of the polls. Ultima Thule was nominated by about 40 members of the public and one of the highest vote-getters among all name nominees. "We are grateful to those who proposed such an interesting and inspirational nickname," Showalter said. "They deserve credit for capturing the true spirit of exploration that New Horizons embodies." The name was suggested to think of MU69 as a distant follow up to Pluto, which New Horizons historically and famously encountered in July 2015. Other names considered included Abeona, Pharos, Pangu, Rubicon, Olympus, Pinnacle and Tiramisu. The final tallies are posted at http://frontierworlds.seti.org/. 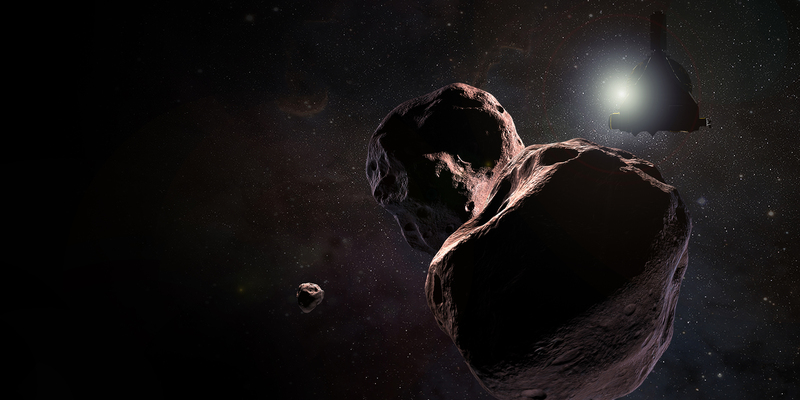 After the flyby, NASA and the New Horizons team will choose a formal name to submit to the International Astronomical Union, based in part on whether MU69 is found to be a single body, a binary pair, or perhaps a system of multiple objects.